In a lawsuit filed July 30 in L.A. County Superior Court, CBS Outdoor claims it is owed $2.23 million for two mural signs on a building demolished twelve years ago to make way for the Hollywood & Highland entertainment and shopping complex, even though the company now has 12 signs on the site that rent for more than $500,000 a month, according to data from a marketing brochure. The city’s Community Redevelopment Agency (CRA) acquired the 12-story office building with the two mural signs through eminent domain in 1998 and demolished it shortly thereafter. According to the lawsuit, the CRA entered into a relocation agreement to allow CBS Outdoor to install the signs on another building in the Hollywood redevelopment area, but didn’t approve the site that CBS wanted at 1025 N. Highland Ave., seven blocks south of the Hollywood & Highland project. 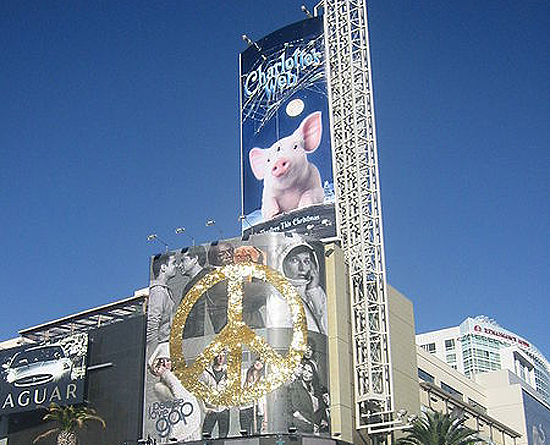 The 12 advertising signs at the Hollywood & Highland complex that was completed in 2001 were permitted by the terms of a development agreement between the property owner and the CRA, although they exceeded limits on size and height in the citywide sign ordinance. The signs, most of which face Hollywood Blvd. and Highland Ave., total 15,000 sq. ft. Despite the lucrative income from these signs, CBS Outdoor claims in its lawsuit that the two mural signs demolished along with the original building were vital to its business. That claim might appear peculiar, given the fact that CBS Outdoor now has six times as many signs at the same location generating at least a half million dollars in monthly revenue, and that it apparently maintained large illegal supergraphic signs for at least six years just a few blocks away. CBS Outdoor is one of the largest billboard companies in L.A., with an estimated 1,600 billboards city-wide. The company also holds the contract with the MTA for bus and transit advertising, and with the city–as a joint venture with JC Decaux–for bus shelters, public amenity kiosks, and other items of street furniture. The Hollywood & Highland complex, which includes the Kodak theater that hosts the annual Academy Awards, is owned by CIM Group, which bought it from the original developer in 2004. The project received $90 million in subsidies from the CRA for the intital construction, and earlier this year the City Council approved a $15 million loan to remodel the theater for a resident troupe of Cirque du Soleil.